Nat Holman (October 19, 1896 – February 12, 1995) was one of the early pro basketball players and one of the game's most important innovators. Known for his exceptional ball-handling and his accurate shooting, Holman was a star player at New York University. 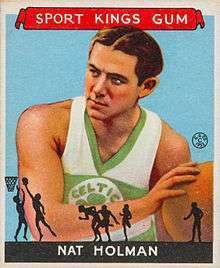 He was also an important part of the Original Celtics, who were no relation to the Boston Celtics. Also a gifted passer and excellent floor leader, Holman was a prototype of later playmakers. Although he played pro basketball until 1930, he took over the head coaching position at the City College of New York in 1920. Known as Mr. Basketball, Holman guided CCNY to the so-called grand slam of college basketball, winning both the NCAA and NIT titles in 1950, a feat that has never been achieved since (and is no longer possible as both tournaments are now done concurrently). In 1951, Holman's CCNY team became involved in a national point shaving scandal involving seven different schools. While several CCNY players, including Ed Warner and Ed Roman were arrested, the investigation cleared Holman of any wrongdoing. The scandal eventually led CCNY to de-emphasize athletics (CCNY currently competes in NCAA Division III) and suspend Holman after the 1951-52 season. He returned for brief stints in 1954-56 and 1958-59, retiring for good in 1959. Holman compiled a 421–190 record in 37 seasons at CCNY, retiring in 1959. Holman also founded Camp Scatico in 1921 and ran the camp until he sold it to his niece and her husband in 1964. In 1922, Nat Holman wrote a book on basketball technique titled Scientific Basketball. In his later years, he lived and died at the Hebrew Home for the Aged in the Riverdale section of the Bronx. ↑ Peterson, Robert W. (2002). "The Rise of the Original Celtics". Cages to Jump Shots: Pro Basketball's Early Years. Lincoln: University of Nebraska Press. pp. 69–79. ISBN 0-8032-8772-0.